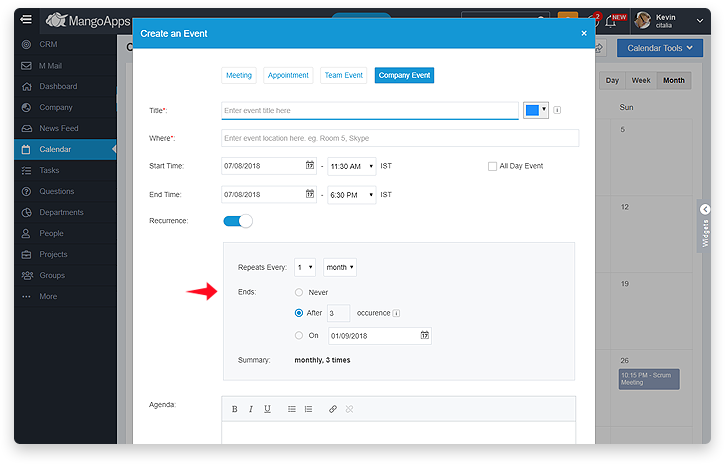 /Calendar & Events /Miscellaneous /How is a Company Event Different from a Team Event in Mangoapps? 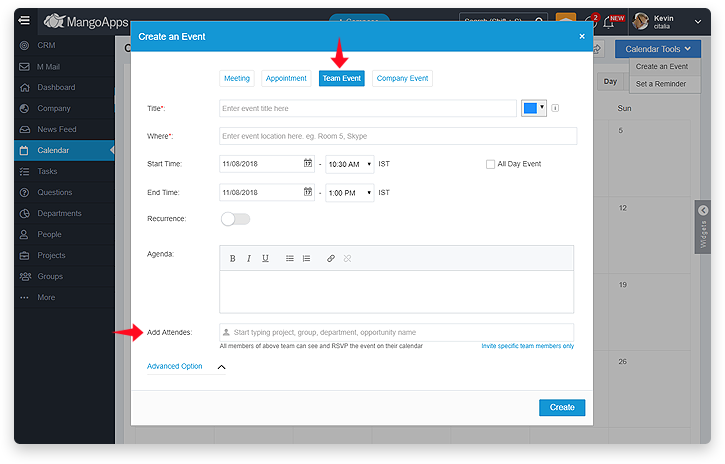 With MangoApps you can create a company event for your all-hands, a blood drive, rallying up volunteers for a cause etc like company-wide events. These Company events are visible to all network users on their calendar. 1) Click on the universal ‘Compose’ button and then on ‘Event’ icon. 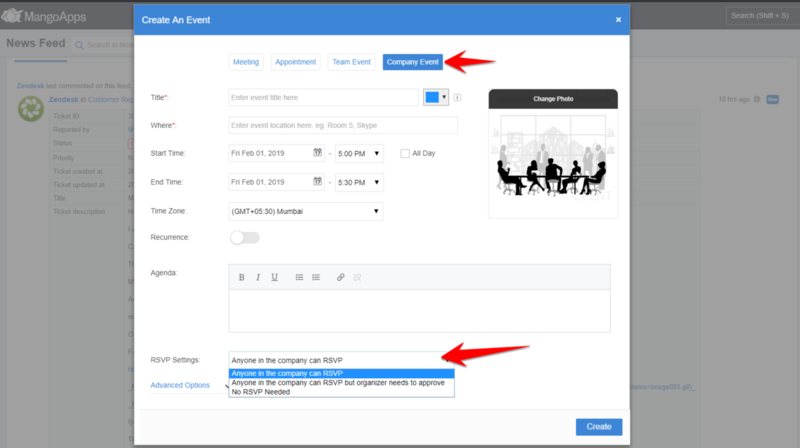 2) Here Select the button ‘Company Event’ and enter the event title, location, Start and end time of the event, as well as specific details about the agenda of the company event. These company events can be automatically set to repeat/re-occur. 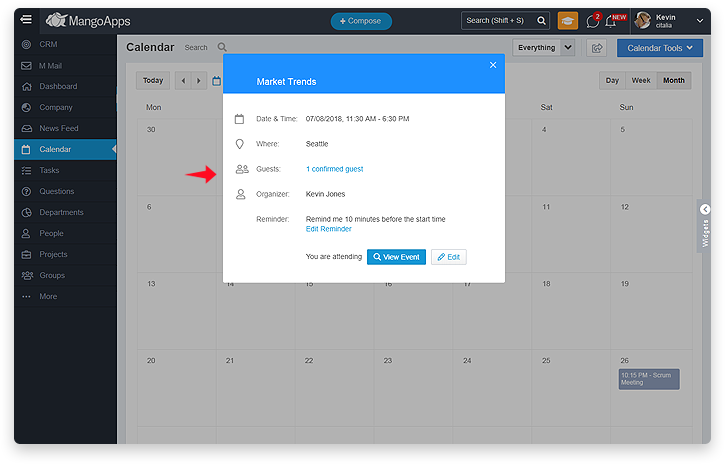 4) When a company event is created all network, users get a notification and these would also be displayed on their calendar. 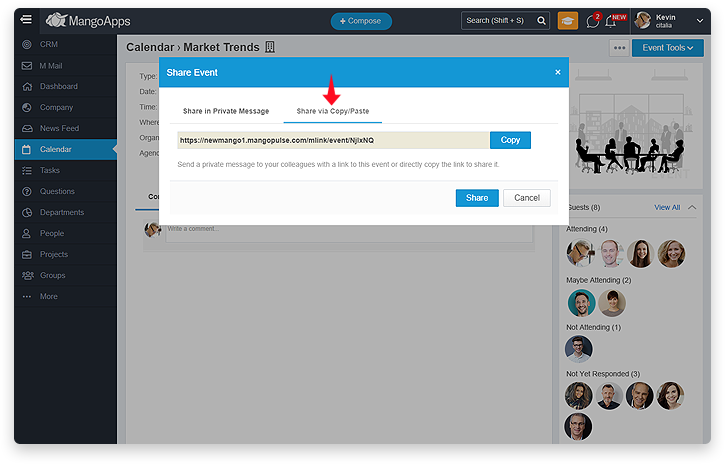 Any user can share the link of a company event with anyone in the company. 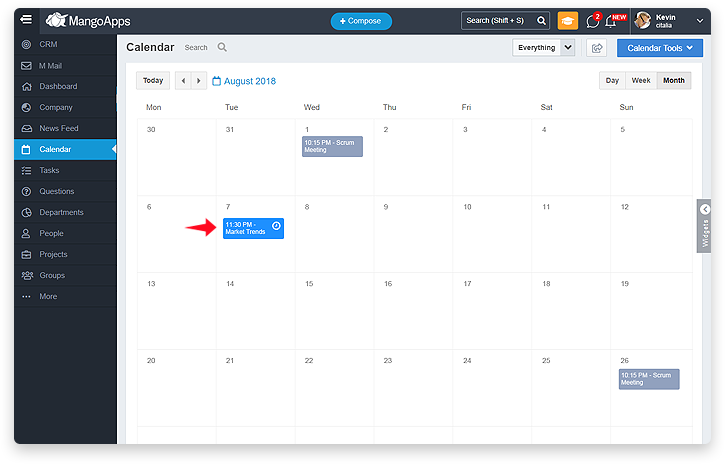 5) Under ‘Advanced’ settings, you can choose to automatically post a comment on your behalf notifying all attendees about the event The notification time for this auto comment can also be selected. 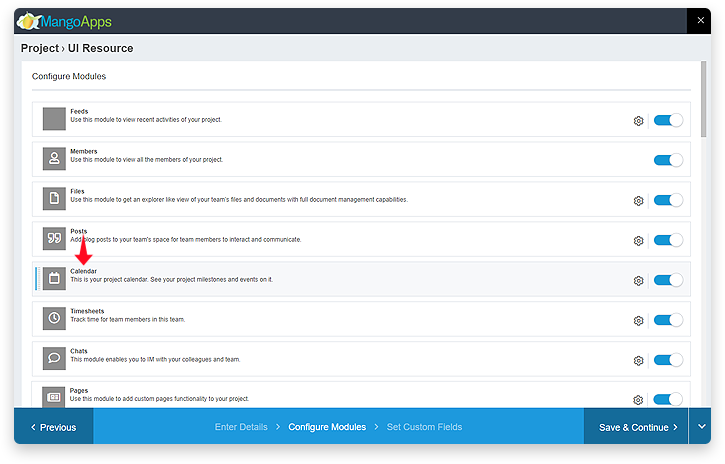 You can also choose to enable Huddle or conferencing options, allow sharing of photos, and enable/ disable the list of invitees for others. You can also create a team event for a specific team occasion, team meeting, team discussions, team outing etc. These Team events are visible to all team members on their calendar. 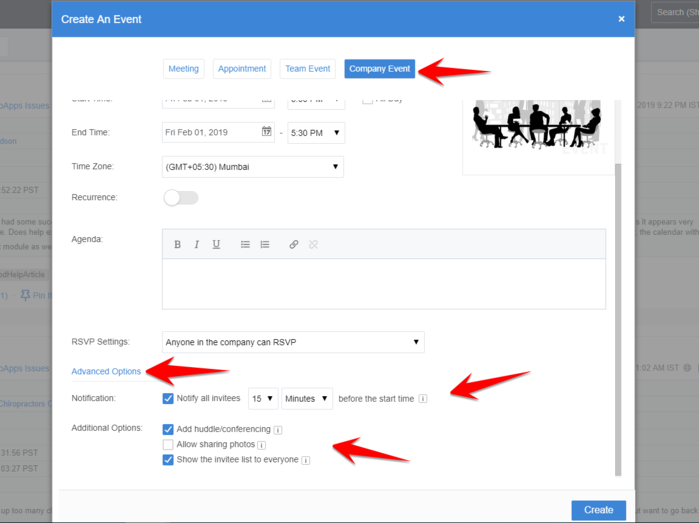 2) Here Select the button ‘ Team Event’ and enter the event title, location, Start and end time of the event, as well as specific details about the agenda of the company event. These company events can be automatically set to repeat/re-occur. Kindly note, with Team Events, only team members can RSVP to a private & secret team event. Also, anyone in the company can RSVP to a public team event. 3) As the team event organizer, you can create a team event where all team members are invited or a team event where specific members from the team are invited. You can select this from the option under ‘Attendees’. 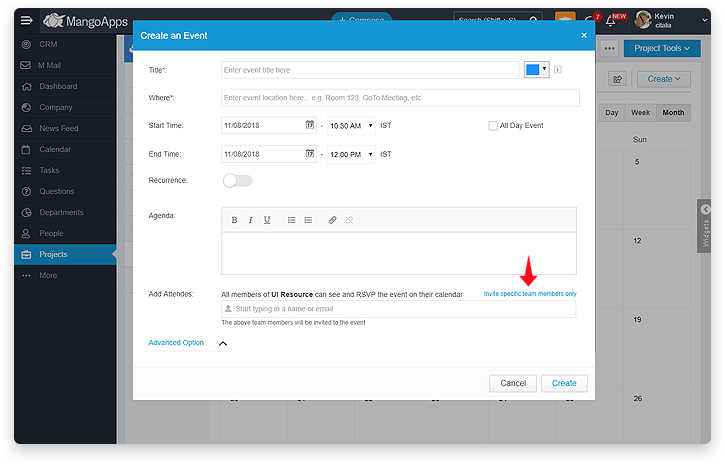 4) Team events can be automatically set to repeat/re-occur by enabling the ‘Recurrence’ option. 5) When a team event is created all invited team members are notified. These events are visible on their Calendar. 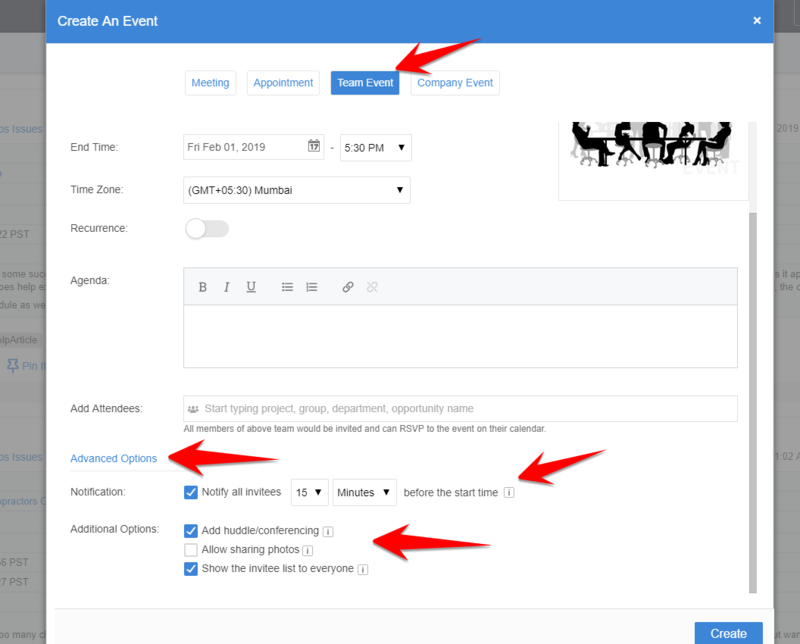 7) Under ‘Advanced’ settings, you can choose to automatically post a comment on your behalf notifying all attendees about the event The notification time for this auto comment can also be selected. 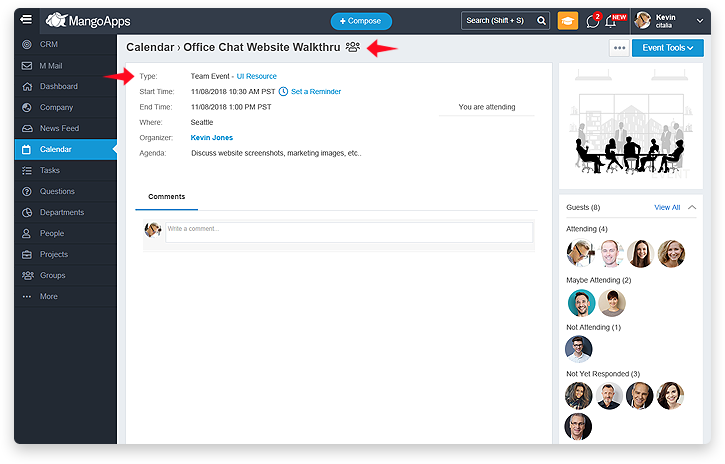 You can also choose to enable Huddle or conferencing options, allow sharing of photos, and enable/ disable the list of invitees for others. 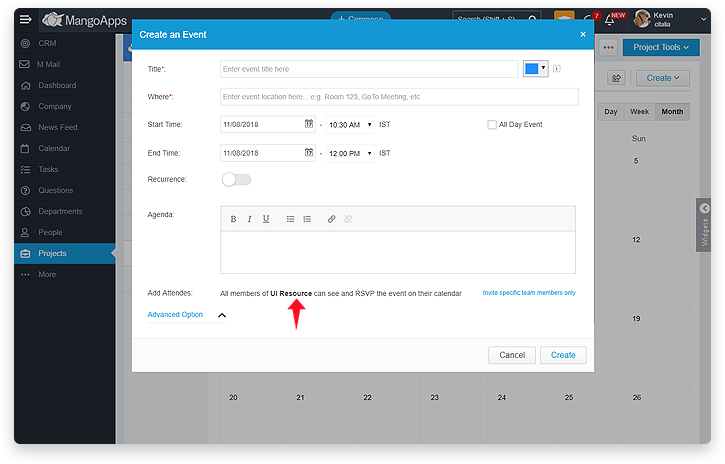 Smart Reminder for Events – When you RSVP that you’re attending an event (on MangoApps), a default reminder is automatically set on your behalf for 10 minutes before the start of the event. Reminders would be automatically set on all the events you RSVP as attending or may be attending. Changes you make here will be effective on events you RSVP from now onwards. 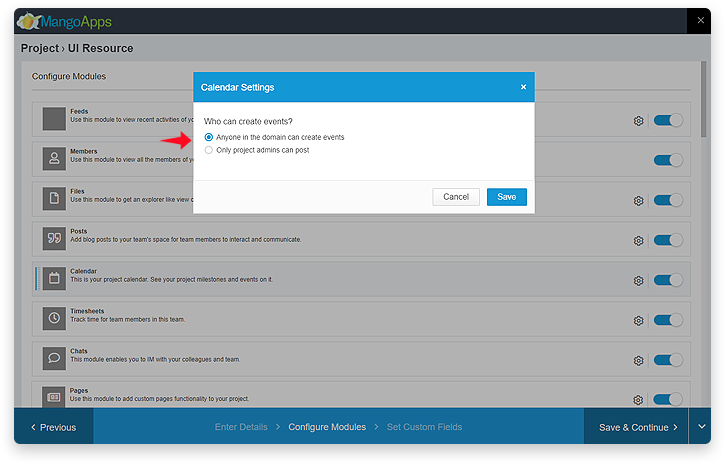 To change an existing event reminder visit the event page and edit the reminder. How to Setup “focused Inbox” Capability in Outlook to Receive Mangoapps Email Notification? How to Create Office Locations?